2 shows in Tôkyô (Kabukiza), 1 in Nagoya (Misonoza), 3 in Ôsaka (Shôchikuza), 1 in Kyôto (Minamiza) and 2 on Shikoku island (Kanamaruza)! Nakamura Kinnosuke, Nakamura Kanzaburô, Nakamura Tomijûrô, Nakamura Kichiemon, Nakamura Tokizô, Kataoka Nizaemon, Nakamura Shikan and Nakamura Jakuemon perform at the Kabukiza! Bandô Mitsugorô, Nakamura Hashinosuke and Onoe Kikunosuke perform at the Misonoza! Sakata Tôjûrô, Nakamura Kanjaku and Nakamura Senjaku perform at the Kanamaruza! Nakamura Kanjaku, Nakamura Senjaku, Kataoka Ainosuke, Nakamura Kikaku and Kataoka Takatarô perform at the Shôchikuza! Nakamura Shinjirô takes the name of Nakamura Kinnosuke II at the Kabukiza, playing the roles of Torazô/Ushiwakamaru, Chôkichi/Yogorô and Isobe Kazunosuke in "Kikubatake", "Sumôba" and "Sakanaya Sôgorô". The story of the revenge of the Soga brothers (sogamono) is one of the favorite themes of Kabuki. Here it is transformed into a fanciful dance using hobbyhorses, children's toys that were one of the sights of the New Year. Starring Nakamura Karoku, Nakamura Shidô, Nakamura Kantarô and Nakamura Shichinosuke. Yoritomo no Shi: a play by Mayama Seika first presented in 1932. Minamoto no Yoritomo created a strong warrior government, but died very soon, leaving things to his son Yoriie (Nakamura Baigyoku). But Yoriie feels that there is something suspicious about his father’s death and is in torment because even though he is supposed to be the most powerful man in the land, no one will tell him anything. It ends with a confrontation with his mother Hôjô Masako (Nakamura Shikan), who is ready to kill her own son rather than let the truth out that could destroy their rule. She declares that a man has only one short life, but the clan must survive to the end of time. Meoto Dôjôji: "Musume Dôjôji" is based on a legend about a woman transformed into a serpent out of jealousy and who destroys a temple bell keeping her from the object of her love. The original dance shows the spirit of the woman who appears at Dôjôji temple as a dancer who wants to celebrate the dedication of a new bell and does a series of dances showing the many faces of femininity. In this version there are two dancers and one is revealed to be a man in disguise and, in the highlight of the dance, transforms the romantic highpoint of the original piece into a comic scene by using masks. Starring Nakamura Kanzaburô as the female dancer and Kataoka Nizaemon as the male dancer. 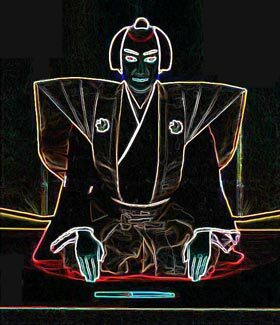 Kikubatake: it is a great classic of period play Kabuki originally adapted from the Bunraku puppet theatre, full of larger-than-life characters and a stage full of dazzling color. In a garden of brilliant yellow and white chrysanthemums, there is Kiichi (Nakamura Tomijûrô), an elderly strategist working for the dictator Kiyomori, his beautiful daughter Minazuru (Nakamura Tokizô) and two footmen, the elegant young Torazô (Nakamura Kinnosuke) and the powerful Chienai (Nakamura Kichiemon). But in fact, Torazô is a young general from the enemy side here to steal Kiichi’s secrets of strategy. Chienai is his retainer. But Kiichi has realized why they are there and also knows that Chienai is actually his younger brother. At the same time, Minazuru has fallen deeply in love with Torazô. Sanemori Monogatari: a play about the early days of the rivalry between the Genji and Heike warrior clans. The warrior Saitô Bettô Sanemori (Kataoka Nizaemon) has been charged by the leaders of the dominant Heike clan with finding Aoi Gozen, the pregnant wife of the leader of the enemy Genji clan. He is to kill her child if it is a son who can succeed to head of the clan, but old loyalties to the Genji lead him to protect the boy. Sanemori tells the story of how Koman, the daughter of the old couple who is protecting Aoi Gozen, bravely fought to protect the sacred standard of the Genji from the Heike. Koman mysteriously comes back to life when her severed arm is rejoined to it. Kôjô: there is a close relationship between the stage and the audience in Kabuki and this is shown by these ceremonial stage announcements where the top stars of the company address the audience directly. This kôjô celebrates the shûmei of Nakamura Kinnosuke II. Sumôba: "Futatsu Chôchô" means "two butterflies" and also comes from the fact that two sumô wrestlers who play important roles in the full length play have names beginning with "chô": Chôkichi and Chôgorô. In order to help his master buy out the contract of the beautiful Azuma, the senior wrestler Nuregami Chôgorô throws a match, letting the younger wrestler Hanaregoma Chôkichi win, hoping to get his help. But Chôkichi loses his temper and the two end up competing in a test of pride. Starring popular actor Nakamura Tomijûrô as Chôgorô and Nakamura Kinnosuke as Chôkichi. Sakanaya Sôgorô: Sôgorô (Nakamura Kanzaburô), a fish seller, has taken a vow to not drink, but when he learns about his sister's unjust murder at the hands of a daimyô lord, a death that they were told was execution for her wrongdoing, he starts to drink again. Drunk, he storms into the lord's mansion to seek an apology. This play by Meiji playwright Kawatake Mokuami is known for its realistic portrayal of members of the common class during the Edo period and highlights their fierce pride and frustration at the privileges of the dominant samurai class. Kamikakete Sango Taisetsu: this play is a blend of "Chûshingura" with its tangled stories of loyalties and masterless samurai that ultimately avenge their master's death and the story of "Godairiki", about the love between a geisha named Koman and the samurai Satsuma Gengobê which is spoiled by the jealousy of a man named Sangorô. Sasano Sangorô (Nakamura Hashinosuke) is married to Koman (Onoe Kikunosuke), but she becomes a geisha to help him to raise the money to help his lord, a man that he has never seen. In the pleasure quarters the samurai Satsuma Gengobê (Bandô Mitsugorô) falls in love with her and spends huge sums of money on her, despite the fact that he needs money for the sake of the "Chûshingura" vendetta. Finally Gengobê gets money and Sangorô and Koman decide to defraud him of the money, which results in a massacre in the pleasure quarters. Ironically, Gengobê is none other than the unknown master for whom Sangorô was trying to raise money. This story of passion and greed takes place against the background of inexplicable fate and the strict requirements of samurai society and adds ample doses of sardonic humor, the perfect play for our times. The widow of the Matsugae family who reigns over the district gives a dance party to choose a husband for her daughter Midori Gozen (Onoe Kikunosuke). They plan to choose the man who dances the best. Tôgorô (Bandô Mitsugorô) the potato digger comes with his friend Jirokurô (Nakamura Hashinosuke) pretending to be the best dancer in Japan. In contrast to Tôgorô, Jirokurô is a good dancer and he knows that Tôgorô is ardently in love with Midori Gozen. Jirokurô wears a mask and dances pretending to be Tôgorô. Then asked to dance without a mask, Tôgorô dances badly. The widow accepts Jirokurô's suggestion and orders Midori Gozen to dance with Tôgorô and Jirokurô. Unable to dance well, Tôgorô begins to express potato digging in dance. The people have never seen such an interesting dance and praise his dance to be the best in Japan. Tôgorô reveals his true identity and apologizes to them, but Midori Gozen would rather marry Tôgorô the potato digger than the best dancer. Finally they all dance expressing potato digging and congratulate Tôgorô and Midori Gozen. 23rd edition of the Spring Kabuki performance Konpira Kabuki Ôshibai at the Kanamaruza on Shikoku island. A short dance in the oldest style of Kabuki, leisurely and full of humor, combining the charm of an onnagata female role specialist with the larger-than-life heroism of the bombastic aragoto style of acting. The strong woman Maizuru stops the powerful, but rash, warrior Soga no Gorô from rushing to a fight by pulling on the set of armor he is carrying. Starring Kataoka Takatarô and Nakamura Kanjaku as Maizuru and Gorô. Kuzu-no-Ha: Abe no Yasuna, a court astrologer in disgrace, has married a beautiful woman named Kuzu-no-Ha, not knowing that she is actually a fox that has taken human form to repay his kindness in saving his life. The couple has a child and lives happily together until the real woman whose form the fox borrowed appears. Knowing that she can no longer stay, Kuzu-no-Ha writes a tearful farewell poem on the paper screen and returns to the wilderness. Starring Nakamura Senjaku as Kuzu-no-Ha and Kataoka Ainosuke as Yasuna. Shûchaku Jishi: lion dances (shishi) show a vigorous masculine spirit that is the guardian of a sacred mountain in China. But the Kabuki tradition transforms this fierce dance into a showpiece for an elegant female role specialist. Living National Treasure Sakata Tôjûrô stars as a top-ranking courtesan elegantly in a banquet parlor who is then transformed into a feminine version of the spirit of the lion. Domo Mata: the artist Matahei has been refused a professional name because of his stuttering. He makes a poor life by drawing folk paintings and decides to make one last effort to gain respectability. His wife Otoku, who is given as much to chatter as Matahei is silent, pleads his case. Turned down again by his master, Matahei decides to take his life. He draws a farewell portrait of himself, a painting so skillful that the lines seep through solid rock and this miracle convinces his master to confer a professional name. Starring Nakamura Kanjaku as Matahei and Sakata Tôjûrô as his wife Otoku. Kôjô: there is a close relationship between the stage and the audience in Kabuki and this is shown by these ceremonial stage announcements where the top stars of the company address the audience directly. This kôjô is led by Sakata Tôjûrô. Meoto Dôjôji: "Musume Dôjôji" is based on a legend about a woman transformed into a serpent out of jealousy and who destroys a temple bell keeping her from the object of her love. The original dance shows the spirit of the woman who appears at Dôjôji temple as a dancer who wants to celebrate the dedication of a new bell and does a series of dances showing the many faces of femininity. In this version there are two dancers and one is revealed to be a man in disguise and, in the highlight of the dance, transforms the romantic highpoint of the original piece into a comic scene by using masks. Starring Kataoka Takatarô as the female dancer and Kataoka Ainosuke as the male dancer. 4th edition of the Naniwa Hanagata Kabuki April program, staged by a troupe of young Kamigata actors. Tengajaya: "Tengajaya" was first performed in 1781 in Ôsaka, dramatizing a true event that occurred over a century earlier. It is in the classical vengeance play form, following the sufferings of the brothers Iori (Nakamura Senjaku) and Genjirô (Nakamura Kikaku) as they search for Tôma (Kataoka Ainosuke), the killer of their father. Iori first falls ill and then is wounded by the enemy and finally ends up living in a shack as a beggar where he is killed by the enemy. But the real reason for the continuing popularity of this is not due to the historical incident, which has long since been forgotten, nor because it is a vengeance play since there are other, much more popular vendetta plays. Originally the role of the servant Motoemon (Nakamura Kanjaku), a retainer of Iori's family who goes over to the enemy side was very small, but the actor Ôtani Tomoemon IV transformed it into a brilliant, virtuoso role. At first Motoemon is supposed to guard his lord, but fails due to his weakness for drink. He promises his brother Yasuke (Bandô Shinsha) to stop drinking, but is tricked by the enemy into getting dead drunk and during this time, Tôma kills his lord. Motoemon is ready to kill himself to atone, but instead decides to go to the enemy side. There is no trick he will not stoop to, in order to turn things to his advantage. For example, Motoemon tells his brother (who is still loyal to Iori) that he has become blind due to illness, no doubt punishment for his evil arts, and asks for charity. But in fact, he soon sneaks in, kills his brother and wounds Iori, all in order to protect his new lord Tôma. But in the end, Genjirô avenges his father's death with the help of former retainers of his father's clan. Ame no Gorô: Soga no Gorô is one of the most famous heroes in the Kabuki world, super-strong and quick to fight. However, this dance shows the soft side of this hero as well as he travels nightly to the pleasure quarter to visit his lover. Starring Kataoka Shinnosuke as Gorô. Kasane: one can never escape past evils. Yoemon is fleeing to the countryside, but Kasane, the woman he abandoned, refuses to let him go. She catches up with him at a lonely river bank. A skull stabbed with a scythe appears and Kasane is possessed by its spirit, actually the spirit of her dead father, and her face suddenly becomes disfigured. She pours out her feelings of jealousy and resentment and Yoemon kills Kasane, but even after her death, he cannot escape her vengeful spirit. Starring Kataoka Takatarô as Kasane and Kataoka Ainosuke as Yoemon. Sonezaki Shinjû: a young merchant named Tokubê has long been in love with the courtesan Ohatsu and is diligently trying to buy out her contract. But he is swindled out of his money by someone he considered a friend. Then he is beaten and humiliated in the precincts of the Ikutama shrine. He sneaks into the teahouse where Ohatsu is and she hides him under the veranda. At this point, Tokubê's "friend" comes and calls him a criminal. Ohatsu fiercely defends Tokubê and asks whether he is prepared to defend his honor by committing love suicide. Silently, from under the veranda, he holds her bare foot and draws it across his neck. The journey to the forest where they commit love suicide is like a dream, half-way between this world and the next and has some of the most famous lines in Japanese theatre: "Farewell to this world and to this night, farewell. To what should we who go to our deaths be likened? We are like the frost on the road leading to the graveyard, vanishing with each step". Starring Nakamura Kanjaku and Nakamura Senjaku in the roles of Tokubê and Ohatsu. Natsu Matsuri: this grisly murder story became a smashing hit when it was first performed in 1745 because of the chivalrous spirit of the many Ôsaka characters appearing in this story, the contrast between a brutal murder and the jovial mood of a summer festival, and the splashing of real water used on the stage. Danshichi, a gallant fishmonger, does everything he can to protect the weak young son of his patron with the help of his companion Tokubê and the older Sabu. Although even Tokubê's wife Otatsu heroically helps out, in the end, Danshichi is betrayed by his evil father-in-law Giheiji and, in the most famous scene of the play, must kill him in a mud-covered fight in a lonely alley with the shouts of the local festival nearby. This program stars Kataoka Ainosuke as Danshichi, with Nakamura Kikaku, Nakamura Kanjaku and Nakamura Senjaku as Tokubê, Sabu and Otatsu. 15th edition of a pedagogical show in Kyôto combining explanation for beginners (done by the professional storyteller Katsura Kujaku) and the dance-drama "Kyô Ningyô", starring Kamimura Kichiya and Kataoka Shinnosuke in the roles of the spirit of the doll and Hidari Jingorô.